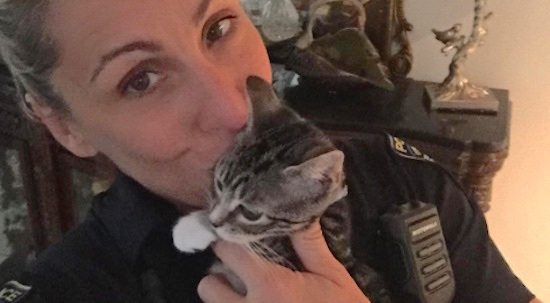 This compassionate police officer is known as the “cop who loves cats” – and that is because she has rescued and found homes for 63 different felines from the streets. Officer Gretchen Byrne of the Boca Raton Police Department in Florida first rescued a family of stray kittens two years ago. Since she already had four cats in her own home, she brought the felines back to the precinct. She then continued to bring every cat that she found on the streets back to the police station. Byrne makes sure that every cat is spayed and neutered – and she pays for it all out of pocket. While 42-year-old Byrne usually keeps the older cats at her home, she will take then younger kittens to the police station so she can check up on them throughout her longer shifts. Inspired by how much attention the police officers were giving to the kittens, Byrne then created an Instagram page to find homes for the strays.